Mackie Mix Series Compact Mixers are reliably rugged, with the proven quality you expect from the world leader in compact mixer design. With proven high-headroom, low-noise design preamps, Mix Series mixers sound great and maintain audio quality from any source. Plus, with their rugged metal chassis and high-quality components throughout, they are a solid investment in reliability. An amazing value, Mix delivers a straightforward feature set that's easy to use and the sound quality you need in rugged designs built to last. Dimensions (HxWxD) 1.7" x 5.5" x 7.7"
Package Includes: . 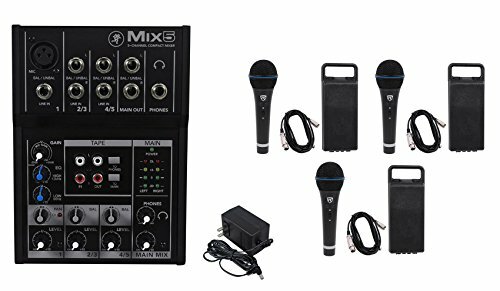 (1) Mackie Mix5 Compact 5 Channel Mixer Proven High Headroom Low Noise Clarity. (3) Rockville RMM-XLR Dynamic Cardiod Professional Metal Microphones W/10' XLR Cables. Mackie Mix5 Compact 5 Channel Mixer Proven High Headroom Low Noise Clarity. 1 mic/line input with studio-level audio quality. 2-band EQ with clean, precise tone shaping . Phantom power for studio condenser mics. Rockville RMM-XLR Dynamic Microphone. Professional 10 FT XLR Cable Included. Steel Mesh Grill. On/Off Switch. Rugged Metal Construction. Natural Sound Reproduction. Beautiful Black Finish (The perfect combination of matte and shiny black finish). Frequency Response: 50Hz-15kHz. Super Cardiod Polar Pattern. Impedance 600 Ohm 5%. Sensitivity -60dB 3dB (0dB=1V/Pa at 1KHz). . .